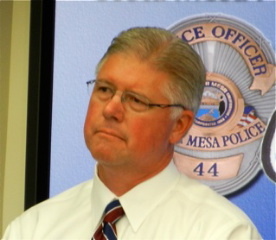 A BUBBLING CAULDRON: Gazsi Named Costa Mesa Police Chief! Gazsi Named Costa Mesa Police Chief! 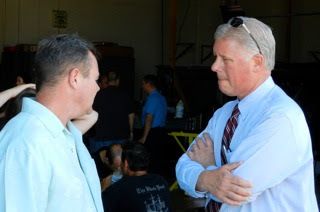 Newport Beach police Captain Tom Gazsi, shown here with Captain Les Gogerty at the recent wake for the ABLE helicopter program, was named as Costa Mesa's new Police Chief at a brief ceremony at the Emergency Operations Center at the Costa Mesa Police Department Headquarters. City Chief Executive Officer Tom Hatch introduced Gazsi, resident of Costa Mesa and a 32 year veteran of the Newport Beach Police Department, and looked to him to bring much needed leadership to the Costa Mesa Police Department. Gazsi, in his acceptance speech, told the assembled group that he was looking forward to the challenges ahead. I've met Tom Gazsi several times in recent months. He's attended most public meetings and certainly has a feel for the atmosphere in our city at this time. I've been impressed with his style and demeanor. I don't know how to measure his leadership yet, but we'll find out about that very soon. He, among all the finalists for this job, has a clear idea of what lays ahead for the Chief of Police in Costa Mesa. He'll be faced with a meddling city council majority, who have forced a staffing level on Hatch that has not been seen since the middle 1980s, and a rank and file demoralized by the events of the past year. It will take a very special leader to take the helm of this ship and provide the direction and leadership necessary to keep the CMPD functioning at the highest levels. In a press release provided during the introduction, HERE, Gazsi's command and leadership experience became evident. His knowledge of the community and leadership experience should be just what this city needs at this time. Gazsi will start his new job within the next few weeks following the completion of a background check and a physical exam. Wait! He still has to pass a physical and background check? That means he still has a chance to get out of this! That was poor planning in somebody's part! OK, Just Kidding! I wish him all the best and hope he does a great job and stays a long time. From the comments on the Pilot story, one would assume Gaszi is already bought and paid for by the council. I don't know whether that's the case, but actions will speak louder than words and I think people should give him the benefit of the doubt and not jump to conclusions. One other thing - got a great mailer from Mansoor today to both me and the former owner of my house (nice database management) demanding a stop to special interest money to protect the democratic process. What a bunch of horsesh*t coming from him. Didn't the US Supreme Court already greenlight the giving from corporations? What a tool he is. Great kudos and support from the Newport City Leaders, wonder why they crossed county lines to hire thier Chief? Apparantly they had a great catch well within their ranks. As long as Mr Gassy (?) understands the the PotStirrrr's opinion is the only one that counts in CM, he should do fine.